Having been in and around the film festival circuit for a while now, one friendly face I’m always happy to see is writer/director/editor/producer/actor and probably film projectionist or craft services attendant if you asked nicely, Frank Mosley. Not only does Frank posses a positive energy, he’s also very smart and fun to be around. Also, dude works hard. In fact, knowing Frank and his work can be a little bit like cinematic Where’s Waldo as you never know where he might pop up unexpectedly. For instance, when I finally got around to watching Jim Cummings’ (fantastic) Thunder Road I had to rewind an early scene where a man is having a mental breakdown because I couldn’t tell if it was Mosley. It was. So, when Frank entered our summer 2016 short film contest with his latest effort, Casa De Mi Madre, I wasn’t all that shocked when he ended up winning. The film went on to a nice festival run but how it came to be is an incredibly cool take that I was lucky enough to find out more about in this recent interview he and I conducted. Hammer to Nail: So, you and I have been pals for a while and I’ve always meant to ask you, how do you keep up this crazy creative output? Glancing at your IMDB, this year alone you’ve acted in 12 projects of all kinds…TV, shorts, feature…voice over! AND, you produced 3 films! You also apparent eat, sleep and maintain personal relationships. How do you manage all this and from Dallas no less?!? hankful to have a manager (as of this past spring) who is repping me as both an actor and director, so it’s been great getting larger opportunities I would have otherwise never have gotten. I can live in Austin (or Dallas, where I just relocated), but as long as people know I’m willing to travel, I can go anywhere for work. So the home base could be anywhere, too. I have to enjoy it while I can because as you know in this business, it’s feast or famine. It can turn on a dime. I just count myself fortunate that it’s been a few really good years working on interesting projects with very nice people. Hopefully I can keep up the momentum. But as I’m getting older, I’m also learning to slow down more. Smell the roses a bit. I hear that’s good for you? It’s all a balancing act. An ever evolving balancing act. HtN: Do you have a daily routine or any kind of advice for keeping creative juices flowing? FM: I think just having a routine at all – of any kind – is important. Everybody is different, but I think consistency is important. For me, it’s coffee, exercise outside, cooking, making some time to read at the end of the day. All those things help me get through the day and keep brainstorming. I listen to music a lot while writing or doing emails. For whatever reason I like to write sitting down, but I like to picture edit standing up. And I’m trying to get back in the habit of outlining/writing/brainstorming ideas/scripts just a little bit every day. Stephen King said the important thing is just to write a little every day, even if you throw it all out later, just to get into the habit and get those muscles working again – like an athlete training for a race. You just got to find that rhythm. HtN: I know a bit of how Casa De Mi Madre came into being but can you first explain how this whole 10-day Abbas Kiarostami situation came to be? Can you talk a bit about that experience? FM: I saw an article on Indiewire, I believe. It was about the workshop and how to apply. It was the third year that Black Factory Cinema, this Barcelona-based film collective, had put this on, where it was also hosted by a film school in Cuba (a school founded by novelist Gabriel García Márquez, no less!). You submit your previous work and answer some very general questions. They select 50 people from around the world – and yet it turned out that one of my best friends, filmmaker Cameron Bruce Nelson, also was accepted. So it was like going to a very cool summer camp with one of your best friends. Couldn’t be better. And then you bond with the 48 other people at this camp and collaborate on each other’s films. They’re all life long friends now. Abbas lectures and gives a prompt. And then you have to pitch him an idea based on that prompt. Only until he approves it, can you go off and make your short film. But since you’re out in the middle of nowhere and cell reception was not existent, all the filmmakers had to rely on one another to make all the films – so everyone worked on more than their own films. Getting to work with Abbas was a dream. He was already one of my favorite filmmakers, so getting to work with him – and just getting to listen to him — was incredible. He was so approachable, friendly, wise. Everything you’d hoped from a master filmmaker like that. Turns how Abbas had been planning to make a film with Márquez before Márquez died, which is why he was going to be in Cuba. He was going to continue the project by himself….or maybe something else, but still in the landscape of Cuba. And then when he passed away himself, it was such a shock. Everything came to a halt. It was barely half a year after our workshop that it was announced that he’d died. HtN: How did you cast the actors and also, get past the language barrier? FM: The actors were cast differently for every project. A lot of folks used local farmers, children, non-actors, in a kind of verite way. Mine, I knew, would require a professional since it was such a performance-based scene, with little editing. More like a piece of theater. We were lucky that Black Factory brought in a bus of professional actors for a “meet and greet” at the school, just in case we did want actual actors. And just in the way that we cast the film, the directing process was the same when it came to necessary, immediate translations. I don’t speak Spanish unfortunately, but Cameron spoke a little. Our friend Yaite worked as both an A.D. and as a translator for the two days of shooting. Couldn’t have done it without her. Was a wonderful challenge to have – it made you really focus on what were the IMPORTANT things you wanted to get across when talking to your actors – and how do you do it in the most concise way possible. Teaches you a thing or two about brevity. When every single thing you’re saying and they’re saying back is repeated in a language, it takes time. Time which you don’t have because you’re pushed for time, losing daylight, and the actors’ windows are short. So it was an amazing exercise in communication. HtN: The film won our Summer 2016 short film contest, if I can ask out of my own personal nosiness, how many of any film festivals that we offered fee waivers for winners accepted your film? FM: We played St. Cloud Film Fest! I wasn’t able to go, but their programming looked amazing the year they showed Casa De Mi Madre! HtN: Aside from the fests we gave waivers for, where else did Casa De Mi Madre play? FM: It world premiered in the U.S. shorts competition at the Champs-Elysees Film Festival in Paris, which was a dream. It went on to play the Marfa Film Festival, Adirondack Film Fest, and in competition at the Dallas International Film Fest, just to name a few. It also played recently at both Anthology Film Archives and the Spectacle Theater (as part of a retrospective of mine) in NYC. HtN: What’s next for you? FM: I’m currently penning a 70s-set dramatic thriller feature, as well as working on a very personal fiction-hybrid-doc series. A few roles lining up for this upcoming year, too – thankfully! But many are too early in development to know when exactly production will start. Still doing that balancing act, basically. But I love it. 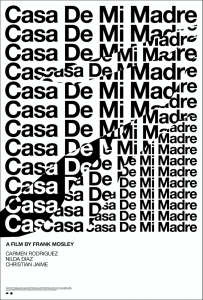 Casa De Mi Madre (My Mother’s House) from Frank Mosley on Vimeo.